It seems that virtually nobody in the public media [I would have said "virtually nobody at all" --ed.] is interested in being taught by the Pope in his magisterial capacity. 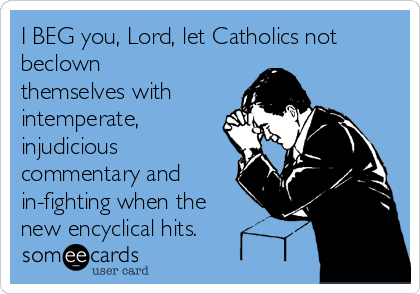 Instead, all the talk is about how the encyclical can or can't be used to advance political agendas. Catholics who fear that the Pope is a secret (or perhaps not-so-secret) radical left-winger, are preemptively questioning the Pope's authority as pope to address questions of the environment at all. Catholics who hope that the pontiff is indeed a radical left-winger, anticipating an encyclical that could have been written by the Environmental Defense Fund (if not the Earth Liberation Front), have suddenly embraced the idea that popes indeed have authority to teach and even bind the consciences of faithful Catholics on questions of moral obligation. RTWT, it's a good precis for Catholics and of interest to those who wish to understand how Catholics understand such things. I agree completely with the good professor. But I have to admit I also feel the cartoon's pain. Not so much about Protestants -- the young evangelicals have totally embraced environmentalism. I'm braced for the coming misuse of whatever the Pope says (which I expect to be sensible and interesting even if challenging to my sensibilities. I predict it will follow the Benedict XVI line about the connection between people's interest in the environment and the defense of life and human dignity. It won't be stated with the same precision as BXVI and will give everyone reason to be uncomfortable).